The Tai Chi Chuan Center will celebrate its 13th World Tai Chi Day in Bryant Park on Saturday, April 25, 2015. There will be free classes and demonstrations by students from CK Chu Tai Chi from 11:00 am to 2:00 pm on the Fountain Terrace. Participants are advised to wear loose clothing and flat shoes or sneakers. All are welcome to participate so bring your friends and family. Tai chi participants practice on the Fountain Terrace. 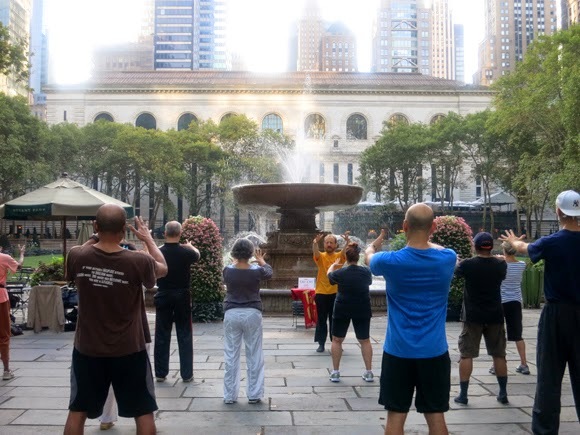 The celebration also kicks off the Tai Chi Chuan Center’s summer-long program of Free Eternal Spring/Tai Chi Classes in Bryant Park. Classes will be held from April 28 to September 29 on Tuesday and Thursday mornings, 7:30 am to 8:30 am. This program has delivered tens of thousands of free class hours over the last eleven years, with average class sizes of more than forty people.